Sleepless in Seattle is a popular 1993 American romantic comedy-drama film directed and co-written by Nora Ephron based on a story by Jeff Arch. The film was inspired by the 1957 movie An Affair to Remember starring Cary Grant and Deborah Kerr. Sam Baldwin (played by Tom Hanks), a Chicago architect and endearing bleeding heart, loses his wife Maggie to cancer. 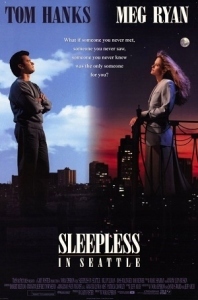 He and his young son Jonah start anew in Seattle, but 18 months later Sam continues to grieve and has trouble sleeping (hence “Sleepless in Seattle”). Annie Reed (played by Meg Ryan), a Baltimore Sun reporter and charming pointy head, is engaged to Walter, a fellow pointy head, in a practical but passionless relationship. Annie’s plan for living is to play it emotionally safe by marrying Walter (played by Bill Pullman)—a hyper-allergic and slightly effeminate man of whom Annie’s highest compliment is that “he’s such a wonderful athlete.” Huh? But after hearing Sam’s moving sentiments on the radio, Annie is experiencing cold feet. What if there is something more to love than agreeing on a china pattern and the number of place settings? The next day Annie impulsively writes a letter to Sam suggesting that he meet her on top of the Empire State Building on Valentine’s Day—just like in the movie. Annie never intends to send the letter—she’s too practical for that—but Becky secretly mails it behind her back. In the end, Annie dumps Walter. Jonah manages to bring Sam and Annie together on top of the Empire State Building on Valentine’s Day, and the couple departs (with Jonah in hand) to live happily ever after. It’s a sappy plot with a predictable ending and limited character development, and yet lots of us love it. Why? Here’s how we see it. The story is about the possibility of love destiny—the notion that lovers are predetermined by destiny to be together. Of all the personality types, only the bleeding-hearted psychics (intuitive/feeling types like the Muse, Poet, Prophet, and Romantic) [Review Personality Traits] are prone to believe in such things—the other 85 percent of us are too practical or intellectual and understand that, “You just can’t keep having all these adolescent fantasies about how exciting your life is gonna be.” Faced with the harsh realities and logic of life, we want to imagine, at least for a little while, that true love is indeed written in the stars. Then, after the credits roll and the music ends, we can go on with our unromantic and uninspired, but exceedingly realistic and sensible lives. NFs don’t believe our lives are going to involve wild romantic gestures but we realise these films have to use dramatic plot lines to depict the emotions that are usually provoked from little things. By this I mean it’s quite difficult for a film to portray the sense of excitement you feel when someone you like touches your hand or catches your eye so they have to exaggerate the physical things but the emotions are the same. And it’s the emotions the NFs care about! When I watch a romcom all I think is I can’t wait to feel like that about someone else again – I can’t wait to feel that attraction, love and care towards them and know they feel the same towards me. That’s why we love romantic movies! We realise that in reality romance is possible – it’s just in the small things and there will also be bumps along the road. We are not idiots or any less intellectual than Ts. And let me just say that those big romantic stories do happen in real life, just not to everyone. Search on quora, there are tons there.